Kargil Vijay Diwas, named after the success of Operation Vijay. On this day, 26 July 1999, India successfully took command of the high outposts which had been lost to Pakistani intruders. 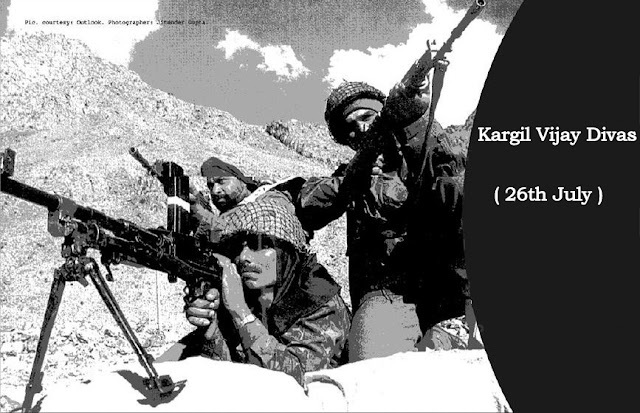 The Kargil war was fought for more than 60 days, ended on 26 July. and resulted in the loss of life on both sides, India and Pakistan. Kargil Vijay Diwas is celebrated on 26 July every year in honour of the Kargil War's Heroes. This day is celebrated in the Kargil - Dras sector and the national capital New Delhi, where the Prime Minister of India, pays homage to the soldiers at Amar Jawan Jyothi at India Gate every year. Functions are also organized all over the nation to commemorate the contribution of the Armed forces.